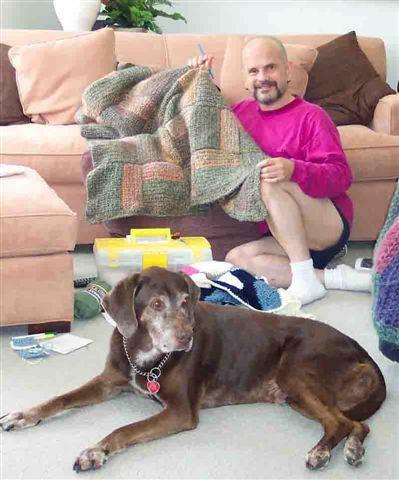 Kyle Knits - a boy, his cats and way too much yarn: Lesson One: Spinning ain't easy! 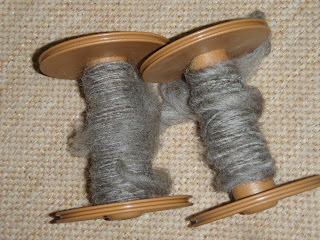 Lesson One: Spinning ain't easy! It looks a lot easier than it is - I guess that's the way life is; we think something looks neat and those who are accomplished fly through this stuff like it's no big deal - I have to remind myself that this is how it was when I first started to knit too - I didn't understand how to make a knit stitch... and now look at me; I can knit! Spinning is a different story. 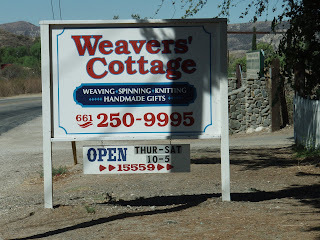 I went to a beginning spinning class at the Weavers' Cottage in Canyon Country, CA this past Saturday - it was a very long class - and really informative. The teacher was wonderfully patient and clear about how the process works (more about method than anything) but since I lack any knowledge at all about spinning, it was a crapshoot - it's kind of like getting behind the wheel of a car not knowing how the stick shift works, and trying to just "drive". 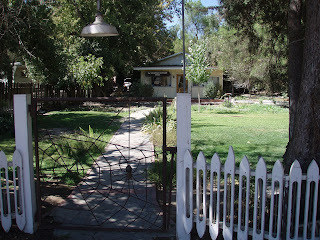 The gate is awesome - the owner's husband (I think) made it for her - I loved the spider the first time I saw this! Of course, this time (second visit to this place) I realized that the pickets on the fence are actually shuttles which are used in weaving! how cute and creative - love it love it! 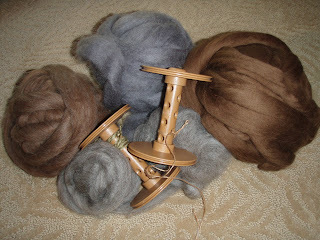 there's tons of rovings and fibers on the shelf for purchase by the ounce - I liked the fibers and LOVE the natural colors (even the not really natural colors) and really wish I was better at this art right off the bat! 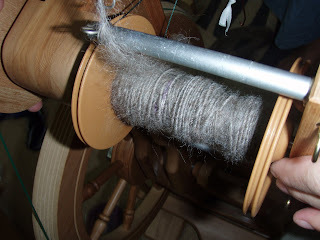 here's one of my first attempts at spinning - with the direction of our instructor, I was able to turn roving into "singles"
the "singles" are plied together (spun together) into one yarn - I was amazed that it took such a long time to create such a tiny bit of yarn - I'm sure that it's faster with experience - but I have LOTS of learning to do. I want to buy a spinning wheel - but didn't know if I loved it enough to make that investment - so I rented one from the shop - they rent wheels by the week, and it's an incredible deal - I checked out the Majicraft Rose wheel - it's the one I was working on in my class - and while I am happy it's in the house, I am not very good at it! I keep waffling back and forth wether or not to buy a wheel this soon into my interest for spinning - on the one hand, why spend that money when it's something I'm not "good" at yet, and on the other hand, I think that if I am learning, I'll learn better on one wheel instead of going from wheel to wheel - AND the value of owning an expensive (and beautiful) wheel may help entice me to continue learning. I bought roving for play and practice - a few different fibers from wool to alpaca/wool, etc - and I'm anxious to try spinning with them - but I can't get the wheel to work the same at home - without a helping hand or watchful eye of the instructor, I'm just too "green" at this art. 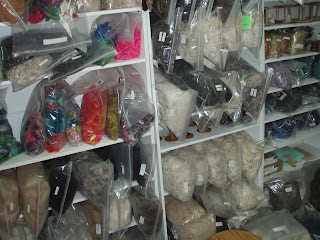 I think I need more lessons - and maybe to go to a spinning group to get help from some other fiber enthusiasts! Willow (left) and Winky (right) love the wheel - I don't know what they love about it but when I brought the rental wheel into the house, they saddled up right next to it - it was soo cute! - I'm torn still about wether or not to buy my own wheel - I want one; we'll see what I decide. I do know that I'm going to try to check them out at the Santa Monica Fiber Festival on Sunday - hopefully I'll be able to make my decision then. I really wanted a Rose for my first "real" spinning wheel. But my dad gifted me with a Jensen so that's my wheel. Like anything else in life, there are things to love about and things to loathe...but all in all I like it very, very much. I really wish I'd taken the time to invest in some lessons before I flung myself into spinning all those years ago. I'd probably be a better spinner had I done that. But I'm not too bad...it just takes some time and practice. Fortunately, once you've spun, that's all you want to do for a while so you'll be practicing quite a bit. :) Have fun! Hi Kyle! Hey, thanks so much for your comments on my blog, I hope you'll pop by again and check out some other FO's. Love your site! So much info, it's great. You know, you're so right about cats and yarn, but my sister and SIL's little dog is just the worst. Whenever I'm over I cannot leave it exposed. Good for you for spinning...as of now, I still haven't picked up the bug. Yet. I started spinning three years ago, with a spindle, then got an Ashford Traddy but after a year of that I needed a faster/more flexible wheel. I got a majacraft little gem II so I could take it travelling - it fitted very nicely in a hardcase suitcase on our way to the states and we could still put DH's clothes in! So if you stick with the spinning, may as well get something good as it will last years! Those are some excellent beginner singles! Wheels hold their value quite well if they're reasonably taken care of. I had the same problem with spinning - I knew I wanted to learn but I had no idea how it worked! It took me awhile (and I don't have any teachers nearby) but I read lots of stuff on the internet and looked closely at a lot of finished yarn to see what I should be going for and it's worked out well. Just yesterday I finally feel like it's working out well for me. I purchased my ST lendrum used for a friend, it was a moderate investment and that way if I didn't like it I wouldn't feel like I spent soo much money on it. The whell is a nice piece of furniture , but if you don't use it is not a great investment. It is pretty big. 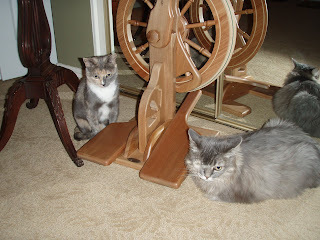 Now youknow how to spin wool, I think the cats are afraid you are going to make wool out of their fur! lol! When I first started spinning, it all felt very awkward and my singles weren't that great. 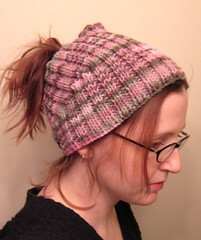 Then suddenly one day everything clicked and my yarn started looking better. It just takes practice. Renting a wheel wasn't an option for me, but I think that's a great idea.